Science Snacks is a resource that I referenced in my list of ten blog post topics for your school blog. 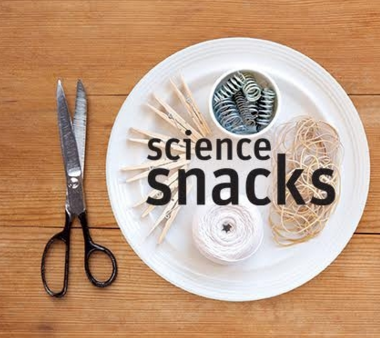 Science Snacks is a resource that provides ideas and directions for hands-on science lessons. Science Snacks features activities that can be conducted with inexpensive and readily available materials. Each Science Snack comes with a materials list and step-by-step directions. Science Snacks are also accompanied by a written explanation of the science at work in the activity. Many Science Snacks, like Penny Battery, include video demonstrations and explanations. You can search for Science Snacks alphabetically or you can search by subject. The subject search is the best way to search if you are looking for an activity to match a lesson plan or curriculum standard that you already have in mind. While originally designed for middle school and high school students, many of the Science Snacks could be altered to fit in an elementary school setting. Many of the Science Snacks activities could be conducted by middle school and high school students at home with the help/ supervision of parents. Using the Science Snacks in that way could be a good alternative to typical homework assignments. Have students do one of the activities for homework and report their observations in Google Documents or as comments in Google Classroom.